Bimac is a premier producer of precision investment and ceramic mold castings. Bimac produces everything from simple castings to sophisticated applications, and caters to a range of industries, including automotive oil and gas, glass, paper, food and medical.  Since 1959, Bimac has manufactured quality castings under strict quality control practices for commercial, aerospace and government entities, in compliance with ISO 9001:2015 certification, as well as military, federal, ASTM and AMS specifications. Although Bimac specializes in medium-run quantities of one to 1,000 parts, weighing from just ounces to over 300 pounds in over 100 metals, we do have the capacity and capability to supply precision investment castings, using the lost wax process, as well as ceramic mold castings, in quantities of tens of thousands in our 35,000 square feet facility. Production capabilities include carbon, alloy, tool steel, stainless steel, and brass and bronze alloys. We also produce nickel and cobalt alloys, including Ni-CR alloy, nickel alloy, and several other proprietary alloys formulated by our engineering team and manufactured to customer specifications.